Examining historical reasons for intelligence failure from World War II. 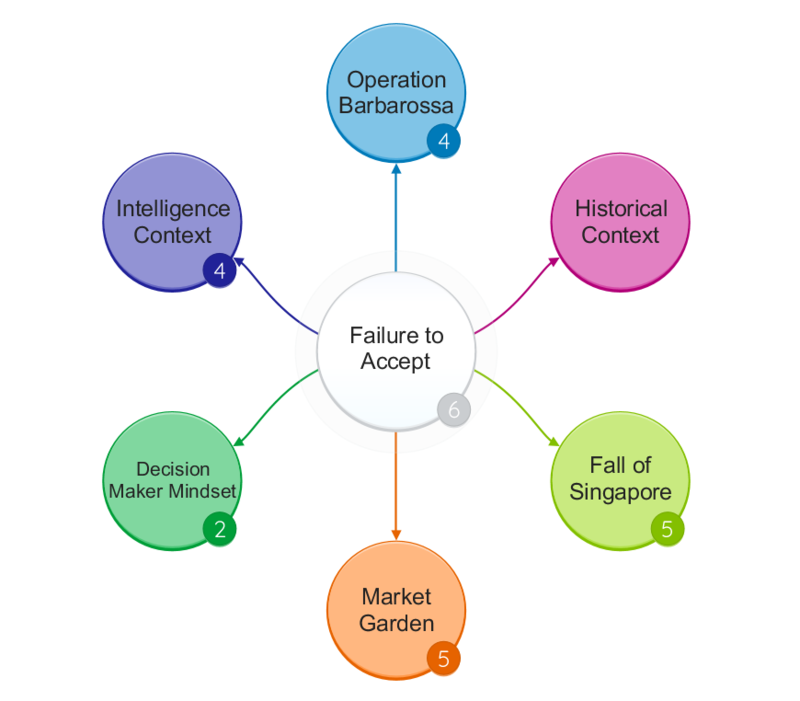 The role of ‘failure to accept’ and The Fall of Singapore, Operation Market Garden and Operation Barbarossa. 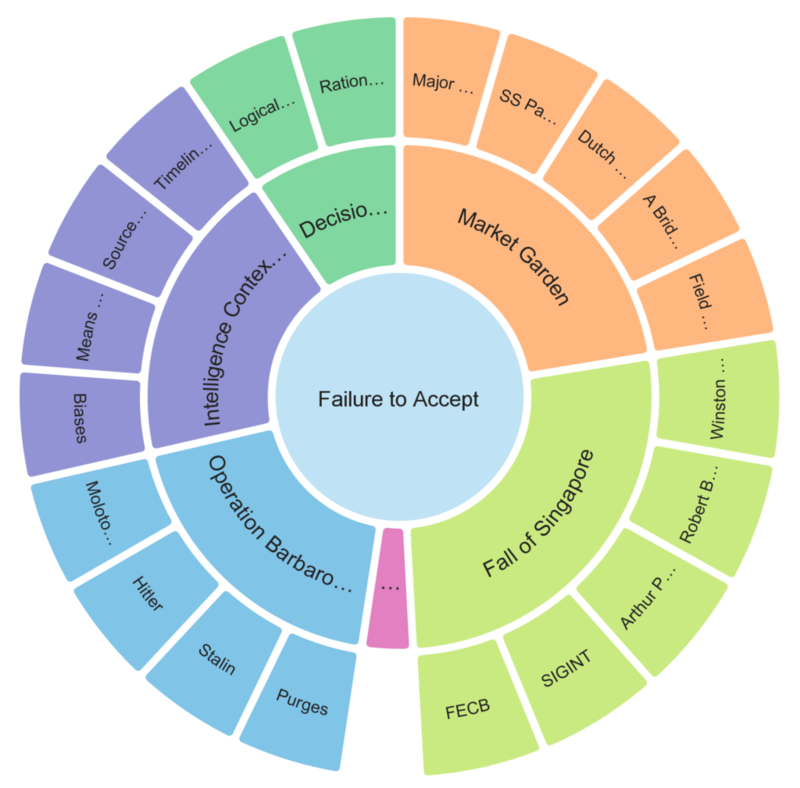 In examining acceptance as a primary reason for intelligence failure, three case studies drawn from World War II are presented. 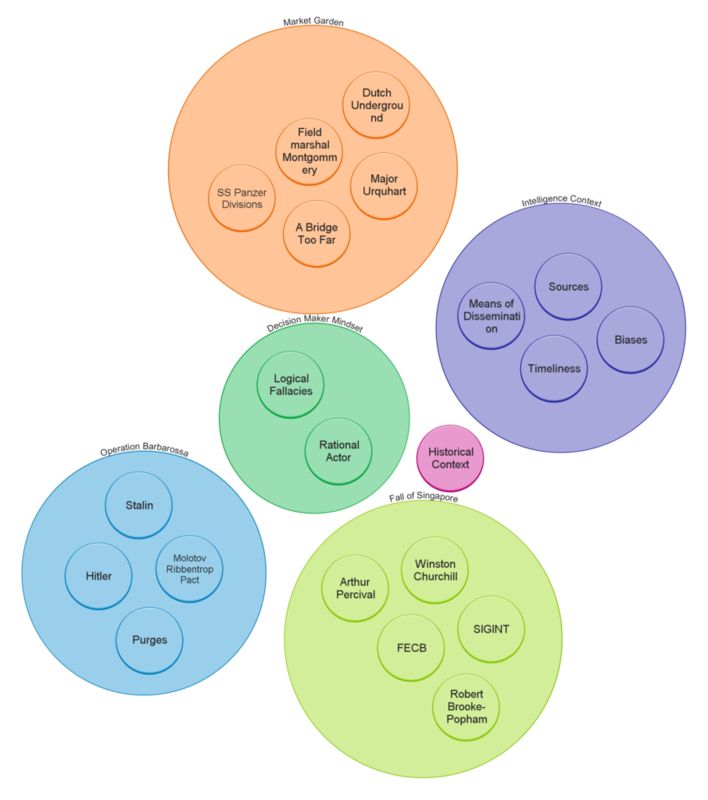 Each is first described in outline using three contexts; the first framing the historical context, the second framing the intelligence context and the third framing the mindset of intelligence recipients and decision makers. The case studies are described in chronological order commencing with Operation Barbarossa and Stalin’s failure to accept intelligence, warning of German invasion preparations in the spring of 1941 (Trenear-Harvey, 2015, pp. 21-22). The Fall of Singapore in February 1942 is next described outlining key factors in British and Allied misinterpretation and underestimation of Japanese intent and capability (Aldrich, 2000, pp. 35-67). The failed attempt by Allied forces to seize the bridge at Arnhem, a key objective of Operation Market Garden in September 1944 is next described (Trenear-Harvey, 2015, pp. 17-20). This focuses on the failure to accept intelligence (or importance thereof) that SS Panzer divisions were stationed nearby (Ryan, 1999, pp. 107-110). Having sketched an outline of each case study, a critical analysis follows. This compares and contrasts factors surrounding non-acceptance of what subsequently proved to be accurate, timely intelligence. 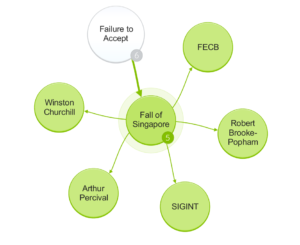 Additional contributory factors leading to intelligence failure in each case are also explored. 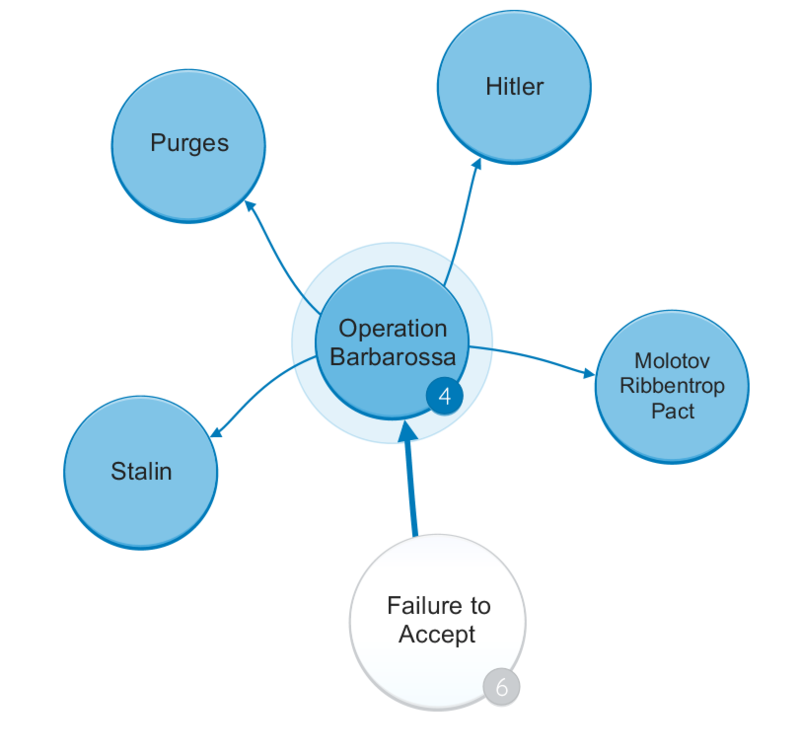 The historical context of Operation Barbarossa can be divided into the internal political condition in Russia, fluid diplomatic relations between Russia and Germany and trust dynamics between Russia and nations fighting or allied to Hitler (Montefiore, 2014, pp. 307-366). In the Russian homeland, Stalin had established a totalitarian regime where his infallibility was unchallengeable and fear reigned. Significant cohorts of politicos, intellectuals, military leaders (Rogovin, 2009, pp. 195-204) and intelligence officers (Haslam, 2000, p. 137) had been executed or imprisoned in the Great Purge. Expressing an opinion critical of Stalin’s omniscience would likely result in torture and execution (Clark, 2005, p. 34). The ideological clash between Communism and Fascism and Hitler’s bellicosity appeared tameable, at least temporarily through the Ribbentrop-Molotov pact. Stalin viewed war with Germany as inevitable, but wished to delay hostilities until at least 1943 to facilitate Russian rearmament. He was highly suspicious of foreign motives, fearing deception would be used to manipulate Soviet military policy, drawing Russia into premature conflict. Intelligence was reaching Russia (as early as December 1940) that the Germans would attack in the spring of 1941. Richard Sorge (Volkman, 1994, pp. 112-120) a soviet spy working in the German embassy in Tokyo provided separate confirmatory reports, having gained access to restricted diplomatic correspondence (Trenear-Harvey, 2015, pp. 21-22). Stalin mocked and dismissed Sorge’s reports, attacking both his character and judgement (Montefiore, 2014, p. 360). Later reports of troop build ups along Russia’s western border, detection of German reconnaissance flights and reports from an agent within Luftwaffe headquarters were all scorned and dismissed. A letter from British Prime Minister Winston Churchill (Gorodetsky, 1986, p. 979) warning of impending invasion was also rejected as attempted entrapment (Montefiore, 2014, p. 356). Despite voluminous intelligence to the contrary, Stalin remained unchangeable in his belief that Hitler would not attack (Roberts, 1995, p. 1317). 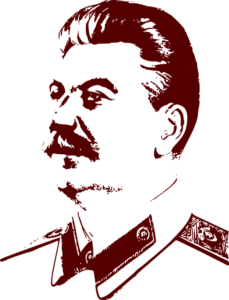 Stalin’s mindset could be described as delusional, inflexible, stubborn and paranoid. He apportions characteristics of a rational actor to Hitler that are not due. Hitler’s egomania is such that he is willing to fight on two fronts simultaneously and has little regard for the Soviet military. Stalin indulges wishful thinking and rejects intelligence that does not fit with his interpretation of events and motives and seems to fall victim to “doctrinal surprise” (Betts, 2009, p. 102-105). Through fear and brutality he denies himself informed and critical advice, resulting in lamentable defensive preparation (Rotundo, 1989). The historical context of the war in Malaya and the subsequent Fall of Singapore (Elphick, 1995, pp. 345-356) is framed by the second Sino-Japanese war (1937-45), and Japanese expansionist ambitions in South East Asia (Gilchrist, 1992, pp. 31-36). Signatory to the Anti-Comintern Pact (1936) (Chapman, 1987, pp. 333-342) and Tripartite Pact (1940), Japan had defensive and intelligence alliances with Germany and other Axis powers. 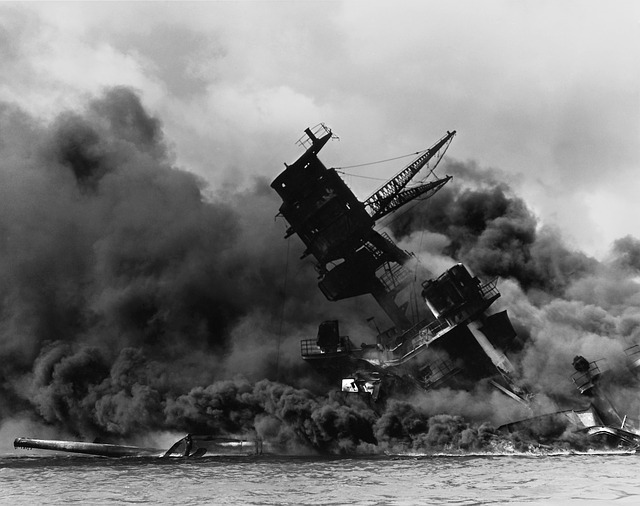 Prior to the attacks on Malaya (8th December 1941) and the (practically) simultaneous attack on Pearl Harbour, neither Japan nor the United States had entered World War II. With the German invasion of Russia in June 1941, Allied forces were prioritised to campaigns in Europe and the Middle East. The rise of Indian nationalism and disquiet across colonies are salient given the significant reliance on Asiatic soldiers in the Malayan defence (Aldrich, 2000, p. 42). The British had no tank deployments in Malaya and lacked air power. Japanese infiltration of Thailand, Burma and Malaya proceeded largely unchecked. In the intelligence context, the Japanese had extensive secret intelligence operations across the region. They received intelligence from Axis powers, as well as from their own Signals Intelligence (SIGINT) and Human Intelligence (HUMINT) operations. This included detailed intercepts outlining British assessment of defensive weaknesses in Malaya and Singapore (Hastings, 2015, pp. 135-173). The British had high quality SIGINT collection, intercepting consular traffic, tracking shipping and naval communications from the station at Kranji (Aldrich, 2000, p. 28). Far Eastern Combined Bureau (FECB) and Joint Intelligence Committee (JIC) London provided several, accurate and long range intelligence forecasts accurately predicting Japanese intent. These reports were largely disregarded by Air Chief Marshal Robert Brooke-Popham (Commander in Chief of Far East Command), Lieutenant-General Arthur Percival (General Officer Commanding, Malaya) as well as Winston Churchill. The mindset of high-command was one of incredulity. Japan simply would not have the audacity to launch an attack against Malaya and Singapore. Japan was preoccupied in China, the Japanese military lacked fighting and technological capability, its soldiers were considered inferior (lacklustre performance against the Chinese fallaciously interpreted). Racial stereotyping abound, high-command failed to recognise the military threat and the vulnerabilities of its own defences. The ability of FECB and JIC to adequately ‘press home’ warnings raises questions. 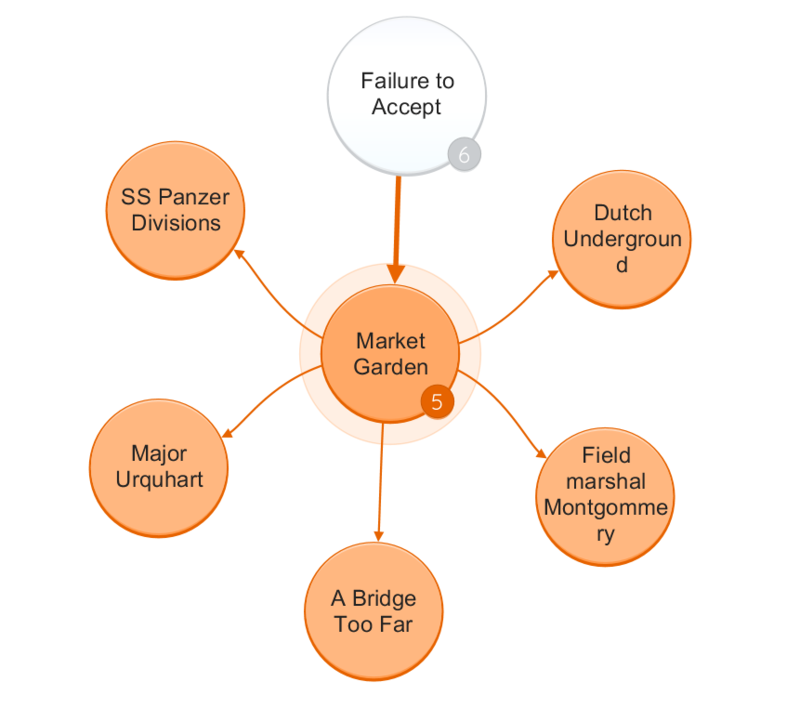 The historical context of Operation Market Garden builds from the Normandy Invasion of June 1944 and the subsequent liberation of France (mid-August) and Belgium (early September). German forces were retreating in disarray through the Netherlands (Ryan, 1999, pp. 3-71). 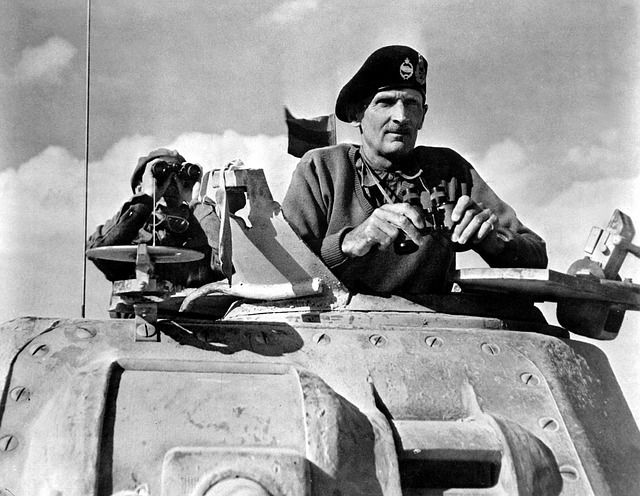 Field Marshal Montgomery argued for a decisive single thrust into Germany through the Ruhr, a bold manoeuvre he believed would significantly shorten the war. The execution of the attack involved an airborne assault behind German lines in the Netherlands alongside a co-ordinated armoured ground assault. The objective was to seize key bridges, including a northerly crossing over the Rhine at Arnhem (Hibbert, 2004, pp. 3-23). Montgomery’s plan although eventually backed by General Dwight D. Eisenhower (Supreme Commander of the Allied Expeditionary Forces in Europe) effectively called halt to the advance of General Paton’s US Third Army (Ambrose, 2012, pp. 504-525). Tensions and personal rivalries between commanders raised the stakes and Montgomery’s unwavering certainty over the operation made its cancellation practically unimaginable. 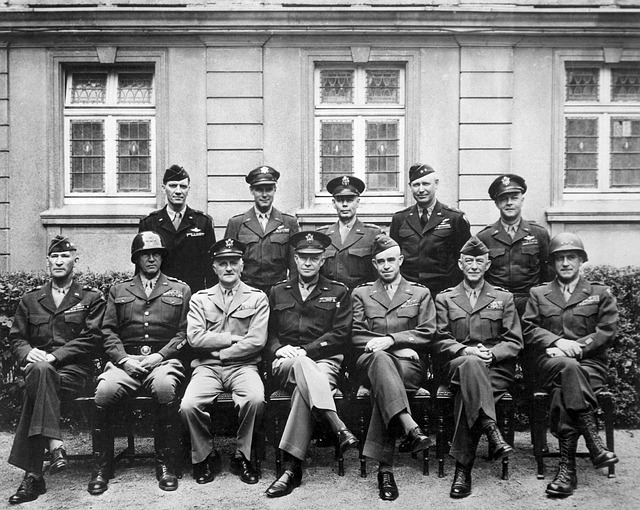 General Dwight D. Eisenhower and senior allied commanders. In the intelligence context, there was a prevailing sense of optimism. The war in Europe seemed to be entering its end game. Two days prior to Operation Market Garden however, the Intelligence Chief at Supreme HQ Allied Expeditionary Forces (SHAEF) Major General Kenneth Strong (Ambrose, 1981, p. 6) briefed the Chief of Staff (Lieutenant-General Walter B. Smith) that 9th and 10th SS Panzer Divisions had been sighted around Arnhem. This information was relayed in person by Smith to Montgomery who dismissed its importance (Ryan, 1999, pp. 107-108). Intelligence reports from the Dutch underground had also been received by intelligence chief Major Brian Urquhart at First British Airborne Corps HQ. Urquhart alarmed at reports of armour in the Arnhem area secured further low-altitude reconnaissance. This provided confirmation. Assessing the aerial photography, Lieutenant-General F. Browning (deputy commander First Allied Airborne Army) remained unconvinced and Urquhart was thereafter consigned to ‘garden leave’ (Ibid, pp. 109-110). Montgomery’s mindset appears rooted in bullish optimism (Bradley and Blair, 1983, 326-333). This is perhaps understandable given the degree to which he is invested in the plan and the size of the prize if it succeeds. His commanders are eager to join the action before German collapse and war’s end. This tempts them to unwisely dismiss the significance of intelligence received. A mistrust of the veracity of intelligence reports from domestic resistance movements in France and Belgium may additionally taint perception of the Dutch source. An opportunity to reconfigure the Arnhem assault is missed. In developing a richer understanding of the ‘failure of acceptance’ of intelligence, it is next helpful to compare and contrast key variables from each of the case studies. 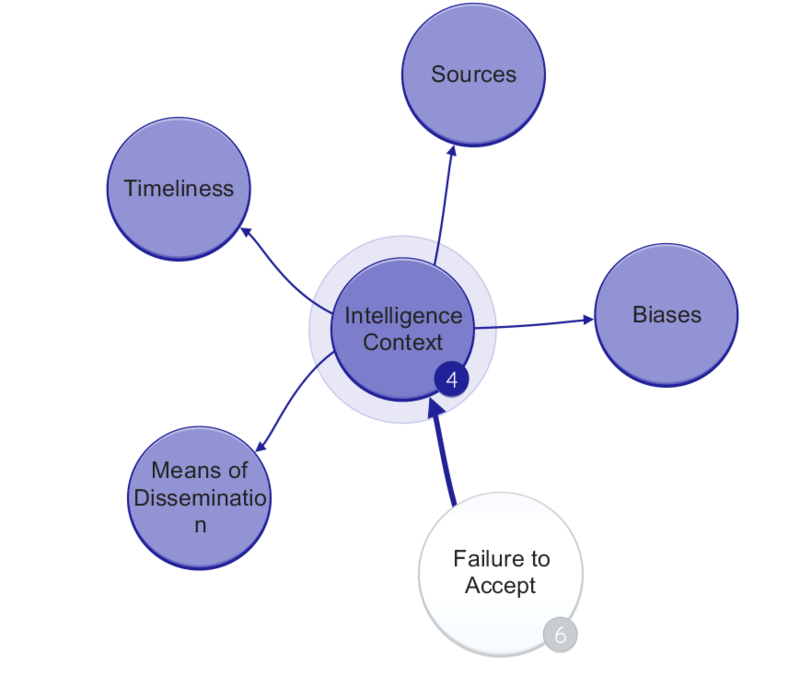 The variables selected are: types and provenance of intelligence sources, timeliness of intelligence, its contradictory or confirmatory nature (compared with other sources and prevailing interpretation of events), its means of dissemination and biases affecting the intelligence recipient or decision maker (Gill, 2007). The three cases are first compared using these variables, then contrasted. 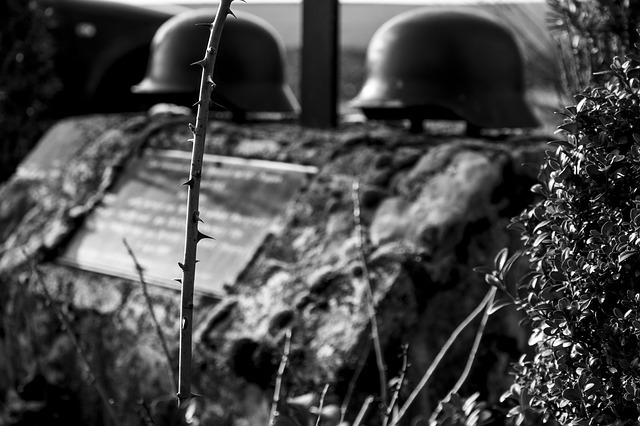 The military context of each case study, and its importance in the timeline of World War II is a notable commonality. Complexity, pace and gravity of decisions must be considered in this context. Stalin had access to HUMINT, SIGINT and Image Intelligence (IMINT) from reliable domestic and foreign sources. Similarly, in relation to Malaya and Singapore, Brooke-Popham, Percival and Churchill had access to quality SIGINT decrypts and HUMINT. SIGINT, HUMINT and IMINT were available to both SHAEF and First Allied Airborne Army in the planning of Operation Market Garden and the assault on Arnhem. In the cases of Operation Barbarossa and the invasion of Malaya, intelligence was both prescient and timely, providing decision makers significant and accurate advanced warning. There were arguable common dissemination weaknesses in Operation Market Garden, where Major Urquhart’s warnings went largely unheeded and in Malaya where FECB head Captain K. Harkness is said to have been too acquiescent (Aldrich, 2000, p. 62). In an extreme sense, failure to disseminate accurate intelligence to Stalin was also a form of acquiescence, configuring it to fit his perception of events rather than challenge it. Common biases can be seen in Stalin’s view that Germany would not attack Russia in 1941, and the prevailing view of British high-command that Japan dared not attack a colonial superpower in South East Asia. That both positions were stubbornly held to despite increasing warning to the contrary proved extreme folly. Colonial hubris, racial stereotyping (Ibid., p. 64) and failure to recognise the quality and motivation of Japanese war-fighters (Sansom, 1944, p. 285) significantly contributed to the loss of Malaya and the Fall of Singapore. Considering key contrasting variables, Arnhem stands out as a decisive offensive operation. From Montgomery downwards, Allied forces were keen for engagement, buoyed by successes against the Germans in France and Belgium and predictions that the war could be over by December 1944. Reports of 9th and 10th Panzer Divisions in the Arnhem area constituted a very thin slice of Operation Market Garden’s overall intelligence picture. This can be contrasted with more abundant and detailed intelligence concerning both Operation Barbarossa and the invasion of Malaya. Stalin and Brooke-Popham seemed preoccupied with avoiding the escalation of German and Japanese aggression in their respective patches. Long range intelligence had gifted them both with strategic warning. By contrast, some of the most importance intelligence from Arnhem came at ‘the last minute’ via first-hand accounts of the Dutch resistance. ‘Failure of acceptance’ of intelligence in relation to Arnhem therefore seems somewhat less egregious. Stalin’s egomania and pathological denial of Hitler’s intent, and British high-command’s scepticism and colonial arrogance in Malaya are rather more ignominious interpretations. Failure to mitigate threats of anti-colonialism and rising Indian nationalism (Aldrich, 2000, p. 42) were additional factors in the Malayan defeat. 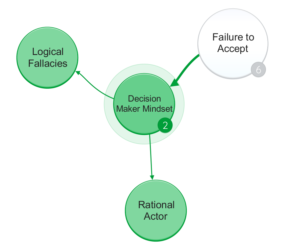 In conclusion, the failure to accept accurate intelligence by the decision maker can be linked to several causative factors. Firstly, the decision maker may doubt the veracity of the sources and the provenance of information used in construction of the intelligence assessment. This was evident in the treatment of Dutch resistance intelligence from Arnhem. Secondly, the quality of analysis may be suspect, particularly where intelligence contradicts majority opinion or where it is based on uncorroborated single or limited source. Thirdly, the decision maker may downgrade the importance of the intelligence, through reinterpretation against a wider context or set of strategic objectives. Montgomery, Browning and others arguably took this view, weighing the various risks and success likelihoods across Operation Market Garden. Fourthly, the decision maker may doubt the credibility of the disseminator, particularly if they are inexperienced, junior in rank, or otherwise lacking in gravitas or presence. Some evidence of this cause can be found in both Malaya and Operation Market Garden. Finally, cognitive and cultural biases may skew the thinking of the decision maker leading to poor use or rejection of valuable intelligence. Stalin’s wishful thinking and homicidal repression of dissent rendered his intelligence machinery impotent. Brooke-Popham, Percival and Winston Churchill underestimated both the resolve and capability of the Japanese war machine. Field Marshal Montgomery and other Allied commanders, believing the Germans routed, may have underestimated the fighting resolve of 9th and 10th Panzer Divisions and other units regrouping along the Dutch / German frontier. We really hope you found our article on Intelligence Failures in World War 2 useful and enjoyable. Aldrich, R. J. (2000) Intelligence and the War against Japan: Britain, America and the Politics of Secret Service. Cambridge University Press. Ambrose, S. E. (1981) ‘Eisenhower and the Intelligence Community in World War II’, Journal of Contemporary History, 16(1), pp. 153–166. Available at: http://www.jstor.org/stable/260621. Ambrose, S. E. (2012) The Supreme Commander: The War Years of General Dwight D. Eisenhower. Anchor Books. Betts, R. K. (2009) ‘Surprise Despite Warning – Why Sudden Attacks Succeed’, in Andrew, C., Aldrich, R. J., and Wark, W. K. (eds) Secret Intelligence: A Reader. Routledge, pp. 91–107. Bradley, O. N. and Blair, C. (1983) A General’s Life – An Autobiography by General of the Army Omar N. Bradley and Clay Blair. Simon and Schuster. Chapman, J. W. M. (1987) ‘A Dance on Eggs : Intelligence and the “Anti-Comintern”’, Journal of Contemporary History, 22(2), pp. 333–372. Available at: http://www.jstor.org/stable/260936. Clark, A. (2005) Barbarossa: The Russian German Conflict 1941-45. Cassell. Elphick, P. (1995) Singapore: the Pregnable Fortress: A Study in Deception, Discord and Desertion. Hodder & Stoughton. Gilchrist, A. (1992) Malaya, 1941: The Fall of a Fighting Empire. Hale. Gill, P. (2007) ‘Knowing the self, knowing the other: the comparative analysis of security intelligence’, in Johnson, L. K. (ed.) Handbook of Intelligence Studies. Routledge, pp. 82–90. Gorodetsky, G. (1986) ‘Churchill’s Warning to Stalin: A Reappraisal’, The Historical Journal, 29(4), pp. 979–990. Available at: http://www.jstor.org/stable/2639366. Haslam, J. (2000) ‘Stalin and the German Invasion of Russia 1941 : A Failure of Reasons of State?’, International Affairs, 76(1), pp. 133–139. Available at: http://www.jstor.org/stable/2626201. Hastings, M. (2015) The Secret War: Spies, Codes and Guerrillas 1939–1945. William Collins. Hibbert, C. (2004) Arnhem. Phoenix. Montefiore, S. S. (2014) Stalin: The Court of the Red Tsar. Weidenfeld & Nicolson. Roberts, C. A. (1995) ‘Planning for War: The Red Army and the Catastrophe of 1941’, Europe-Asia Studies, 47(8), pp. 1293–1326. doi: 10.1080/09668139508412322. Rogovin, V. (2009) Stalin’s Terror of 1937-1938: Political Genocide in the USSR. Mehring Books. Rotundo, L. (1989) ‘Stalin and the Outbreak of War in 1941’, Journal of Contemporary History, 24(2), pp. 277–299. Available at: http://www.jstor.org/stable/260824. Ryan, C. (1999) A Bridge Too Far. Wordsworth Military Library. Sansom, G. (1944) ‘The Story of Singapore’, Foreign Affairs, 22(2), pp. 279–297. Available at: http://www.jstor.org/stable/20029824. Trenear-Harvey, G. (2015) Historical Dictionary of Intelligence Failures. Rowman & Littlefield. Volkman, E. (1994) Spies: The Secret Agents Who Changed The Course Of History. Wiley.